A meal in Chinese culture is typically seen as consisting of two components. First, a carbohydrate source or starch typically rice, noodles, or buns, and secondly an accompanying dish consisting of vegetables, fish, meat, or other items. This cultural conceptualization is in some ways in contrast to Western meals where meat is often considered the main dish. Chopsticks are the primary eating utensil in Chinese culture for solid foods, while spoons are used for drinking soups. Food is usually prepared in bite-sized pieces and is ready to be eaten right away. Traditionally, Chinese culture considered using knives and forks at the table “barbaric” due to fact that these implements are regarded as weapons. It was also considered ungracious have guests work at cutting their own food. Anhui cuisine is one of the eight most famous cuisines in China and features the local culinary arts of Huizhou. The highly distinctive characteristic of Anhui cuisine lies not only in the elaborate choices of cooking materials but also in the strict control of cooking process. Anhui cuisine chefs pay close attention to the taste, color and the temperature of their dishes and are specialists at braising and stewing. Anhui dishes preserve most of the original taste and nutrition of the materials. Generally the food here is slightly spicy and salty. Ham is often added to improve the taste and sugar candy added to gain freshness. Steamed stone frog – Stone frogs are a specialty found in the Huangshan Mountains. They are rich in protein and calcium and are thought to improve your vision and nutrition. Bamboo shoots cooked with sausage and dried mushroom – A traditional dish from the Huizhou Mountains. Cooked with sausage and dried mushrooms, the bamboo shoots are noted for there fragrant smell and taste. Beijing cuisine is refined combination of Shangdong and Imperial cuisine. Beijing chefs generally put more effort into the method of cooking while using more common ingredients. Deep-frying, roasting, instant-boiling, stir-frying and stewing are among the most common methods of cooking. Because of its more northerly location locals prefer eating noodles, buns, or dumplings instead of rice. 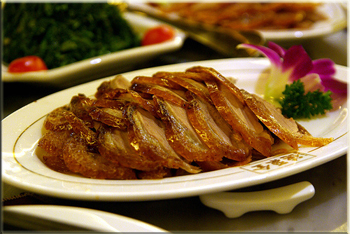 Peking Roast Duck – The most famous dish associated with Beijing is Peking Roast Duck. The crisp skin of the duck is the most prized part. To achieve such crispness, the duck is air-dried then coated with a mixture of syrup and soy sauce before roasting. When ready, it is presented ceremoniously and the skin deftly carved. These pieces are wrapped in thin pancakes with onions or leeks, cucumber, turnip and plum sauce. Some restaurants will also serve almost every part of the duck, from the webbed feet to the beak and liver. On request, the remainder of the duck meat can be sauteed with bean sprouts, and the bones made into a wonderful soup with cabbage. Cantonese food is the most popular and widely recognized style outside China. Cantonese cuisine originates from the southern region of China around the Guangdong province. Cantonese food is famous for its wide variety and sweet flavors, which has unfortunately lead to the saying that the only four-legged things that Cantonese people won’t eat are tables and chairs. Cantonese cuisine includes almost all edible food in addition to the staples of pork, beef and chicken, such as snakes, snails, insects, worms, chicken feet, duck tongues, and entrails. Yummy! Dim Sum – Dim sum is usually served at breakfast or brunch and includes a wide variety of foods. Dumplings, siu mai, chicken feet, steamed spare ribs and spring rolls are all good examples of dim sum. Char Siu (BBQ pork) – The distinctive feature of char siu is its coating of seasonings which turn the meat dark red, or occasionally burnt, during cooking. The seasoning mixture is usually sugar or honey, five-spice powder, red food coloring, soy sauce, and sherry or rice wine. 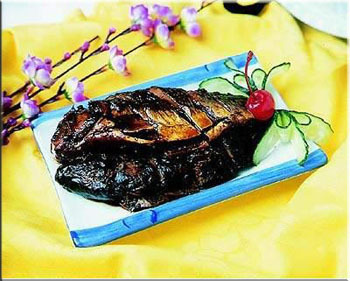 Known as “a land of fish and rice” in China, Jiangsu Province has a rich variety of ingredients available for cooking. Using fish and crustaceans as the main ingredients, the food is best experienced fresh. Jiangsu dishes tend to taste fresh, light and mellow compared to other cuisine styles in China. Typical courses of Jiangsu cuisine are salted dried duck (Nanjing’s most famous dish), Squirrel with Mandarin Fish, Yangzhou Style Fried Rice, “Lion-Head” Meatball with Crab Roe, and Wuxi Sweet & Salty Spare Ribs. Also known as Xiang Cai, Hunan cuisine has already developed into a famous culinary school in China. While similar to Szechuan cuisine, Hunan Cuisine is often spicier and contains a larger variety of ingredients. Hunan cuisine make extensive use of chiles to cleanse the palate and to cope with the humid climate (hot foods such as red chili peppers dry out and cool down the body, making it easier to handle the heat and dampness). Dong’an Chicken – This dish originated from the Tang Dynasty, more than 1200 years ago. The chicken tastes quite spicy, but is also sweet and tender. Orange Beef – The beef is marinated overnight and then washed and marinated again with a mixture of egg whites, wine and pepper. It is then braised with soy sauce and simmered to perfection! Through years of culinary practice and the assimilation of the art in other styles of cuisine, Shanghai chefs have also created a style of cuisine peculiar to the region. Shanghai dishes are usually characterized by the use of heavy and highly flavored sauce. The use of sugar is another uniqueness found in Shanghainese cuisine and, especially when used proportionally with soy sauce, the taste created is not so much sweet but rather savory. 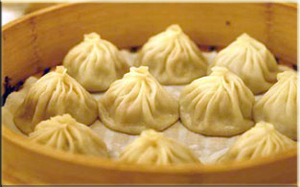 Xiao Long Bao (Little Dragon Bun) – Unlike the buns in northern China, these buns are very small and easy to swallow. The buns are usually steamed in containers made of banboo. The skin of the buns are very thin and the bun is very juicy. Chou Dou Fu (Smelly Tofu) – This dish has a very distinctive and potent smell that can be detected half a block away. 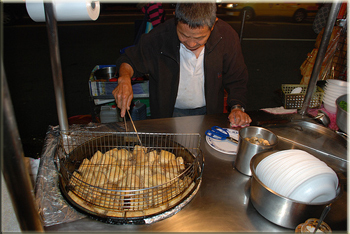 Smelly tofu is a popular local food found throughout all of Shanghai. The tofu is fermanted (hence the smell) before being fried and served. Despite the odor, most foreigners love it after there first taste and it is dirt cheap too! 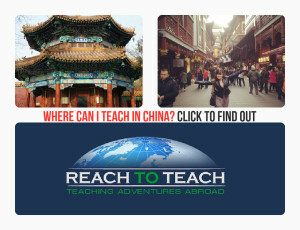 One of the major eight schools of cooking in China, Zhejiang cuisine offers combined flavors of Hangzhou, Ningbo and Wenzhou. Each of the three sub-cuisine traditions is noted for there special flavors and tastes, but they are all characterized by the careful selection of ingredients, emphasizing minute preparation. Special care is taken in the cooking process to ensure the food is fresh and tender. Zhejiang cuisine is best represented by Hangzhou dishes, including Hangzhou Roast Chicken (commonly known as the Beggar’s Chicken, which is especially delicious with a pleasant aroma of lotus leaves), Dongpo Pork, West Lake Vinegar Fish, Sistern Song’s Shredded Fish Soup. Dongpo Pork – The dish is made from pork bellies which are cut into four pieces and briefly boiled and then rinsed. Next, the pork is combined with sugar, soy sauce, onion, ginger and rice wine and cooked for two hours. Finally, it is transferred to a bowl, the juices from the pot strained over the meat, and the bowl covered and steamed for another two hours. Certainly time intensive but the results are delicious!